The building is located in the former home of Alfred and Marjorie Crabaugh, two people who served the Russellville community proudly. Alfred as the dean of Arkansas Tech University, and Marjorie as the founder of local chapters of the Salvation Army, Girl Scouts and more. Now, a decade after their deaths, it’s been made a safe place for the most vulnerable of our community. 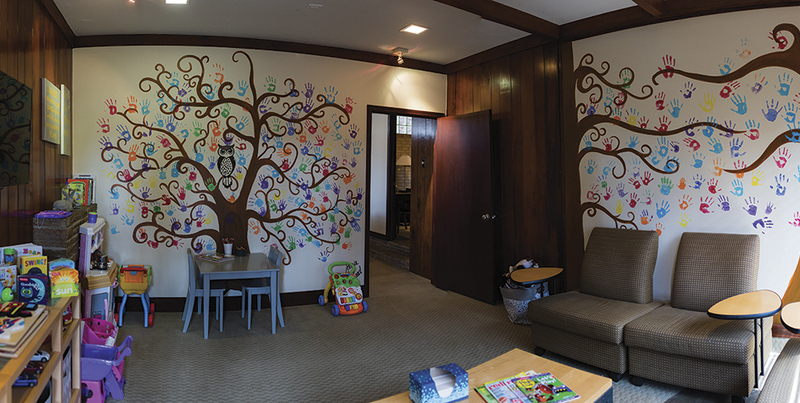 Inside the River Valley Child Advocacy Center, a painted winding tree and an owl adorns the wall along with an array of small handprints. Each print represents a physically and/or sexually abused child. There are so many handprints — round palms and stubby fingers, swirls and whorls of each unique little fingerprint captured in all the colors of the rainbow. Your heart breaks at the sight. Yet, there is also a feeling of relief. With the advocacy center here in the River valley, children receive the help they deserve. The number of children helped — 225 since its opening in 2018 — is staggering. But the number is an abstraction. The handprints make it real. RVCAC offers guidance and assistance through every step of the journey out of abuse, the sometimes lengthy and tiresome legal battles, the aftermath of trauma and emotional damage. It’s also a place of comfort for the children where they can calm themselves in a play room complete with a tiny train station and plastic cars instead of a cold investigation room. The non-profit has three services for families: forensic interviews, advocacy, and trauma-focused therapy. RVCAC is in the process of adding a medical unit where children will be able to receive on-site sexual assault exams. “Every service we provide to families is at no cost,” says Marilyn Sanders, RVCAC executive director. Forensic interviews are conducted in a small room that could almost be a closet. The cozy and intimate setting with only two chairs helps put children at ease. There’s also a drawing board, a way for children to express themselves when words don’t easily come. The interviews are a delicate matter. Abused children often lose trust, and trust in the interviewer is vital because everything moving forward hinges on the interview. “The child and I will come in this little room by ourselves.” explains Marilyn. “While I’m doing the interview it’s all recorded, and the investigators of the case are in the observation room watching the interview while it’s taking place.” The recordings serve as a critical investigatory tool, allowing agencies to share information to further their sexual abuse investigation while not burdening the child with multiple interviews that can be traumatic. It’s not always an easy task. Everything must come from the child with no prompts from the interviewer. There are also children who are afraid they’ll get someone in trouble, so they protect their abuser. Sometimes it’s a parent. Sometimes the abuser is all the child has left. “Kids still love their parents, no matter what,” says Marilyn. Editor’s note: Names have been changed in accordance with HIPPA law. To truly understand what RVCAC does, it’s best to follow a case. When Sharon found out about what happened to her daughter Karen, she was angry. Ready-to-take-action-angry. “The ball dropped,” Sharon said. “All rationality went out the window.” She wanted justice for her daughter. RVCAC persuaded Sharon that there was a better way to handle the situation, and the family embraced the support and care that the center offered. It didn’t stop there, though. Amy referred Sharon and Karen to counselor Sherry Tatman. During the nine months that Karen saw Sherry, Amy transported her to and from the sessions. Because staff and employees of RVCAC see what Sharon and Karen and other families go through every day, being employed at RVCAC requires a degree of emotional disconnect. “We have a great relationship with our team, and I think if we didn’t have that it would be harder than what it is,” echoes Amy. Through the efforts of each investigator, counselor, and advocate, RVCAC offers gentleness and comfort to each and every child and their family. The center provides an outlet to handle emotional injuries in a healthy way. It’s a place where children are able to receive what was once robbed of them — safety, security, trust, and even the glimmer of hope for better days ahead.